1/4 Pint, 4 ounces. 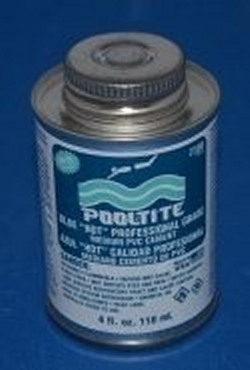 (good for 50-100 glue joints of 1" pipe) of Pool-Tite BLUE PVC Low VOC Glue. Meets NSF, IAPMO and ASTM D-2564 for glue. BLUE glue. Best for wet applications where you can't get the pipe perfectly dry. Great for in the field repairs. One of the best glues on the market. Made in the U.S.A.